In 2005 NIST completed the three-year Federal Building and Fire Safety Investigation of the World Trade Center Disaster. The investigation addressed many aspects of the catastrophe, from occupant egress to factors affecting how long the WTC towers stood after being hit by the airplanes, with a goal of gaining valuable information forthe future. A critical aspect of the investigation was the metallurgical analysis of the recovered structural steel. The analysis included characterization of mechanical properties, failure modes, and structural response determined from photographic evidence. The collapse of the World Trade Center (WTC) towers was the worst building disaster in human history. Engineers, emergency responders, and the nation were largely unprepared for such a catastrophe. The task of the NIST investigation was to determine the details of why and how the towers collapsed. As part of this investigation, the Metallurgy and Materials Reliability Divisions characterized the recovered structural steel. Collect and catalog physical evidence. Categorize failure mechanisms from visual evidence. Determine steel properties to support modeling. Correlate determined and specified steel properties. Analyze steel to estimate temperature extremes. Analysis of fracture surfaces of recovered perimeter columns struck by the aircraft showed that the steel remained ductile even at high deformation rates. Data such as these were important in assuring the accuracy of the steel properties supplied to the modeling efforts. 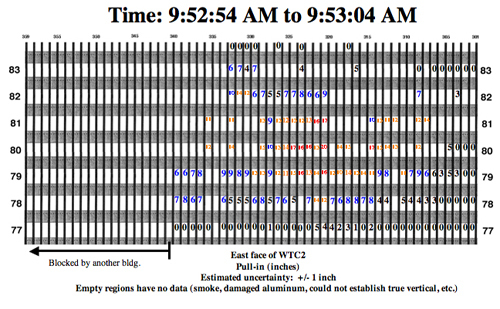 Figure 1: Pull-in map of perimeter columns (in inches) on the east face of WTC 2, 9:03 a.m. Photographic analysis demonstrated that perimeter columns of WTC 2 began to pull into the building almost 30 minutes before collapse. Our staff developed pull-in maps based on pre-collapse photographs, Figure 1, which were instrumental in constraining the finite element models of the building deformation. 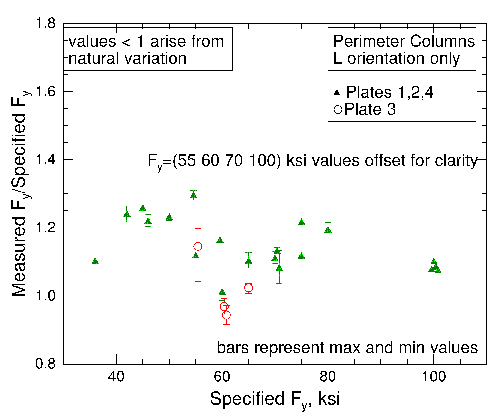 Figure 2: Measured yield strength of perimeter column specimens. Tensile tests of the dozens of steel types and grades recovered showed that their yield and tensile strengths are consistent with the expected values. In a few cases, the strengths of the NIST-tested specimens were slightly less than called for, but the number of under-strength samples is consistent with the natural variability in steel strength and the damaged state of the recovered steel. Figure 2 shows the ratio of measured to specified yield strength for recovered perimeter column steels. Photographic evidence indicated that 16 of the recovered perimeter column panels from WTC 1 were exposed to fire before the collapse. Our staff developed a forensic test based on paint cracking due to thermal expansion of the steel. This test placed limits on the time and temperature exposure of the recovered columns. Results indicate that only three locations on these 16 recovered columns reached temperatures above 250 °C. The final draft of the investigation report was issued for public comment in June 2005. The fires and subsequent collapse of the World Trade Center focused attention on the vulnerability of structural steel to fire. Recently steels designated as "fire-resistive" have become available. This project is developing a standard test method for quantitatively evaluating and comparing the resistance of structural steels to high-temperature deformation. All steels lose strength with increasing temperature. By 600 °C, most structural steels have lost more than half their strength. At intermediate temperatures the strength is independent of time, but above 500 °C, creep, or time-dependent deformation, further reduces the load-carrying capability. To combat this loss of load-carrying capability, structural steel in buildings is insulated to keep it cool in fire. Fire resistive (FR) steels are intended to be drop-in replacements for existing grades of structural steel. They can meet the same specifications, have similar weldability, cost only marginally more, but have superior elevated temperature strength. Their superior high-temperature properties have the potential to provide extra time for building occupants to escape a fire. In Japan and Europe, FR steels are qualified based on high-temperature retained yield strength. Although this definition employs a simple, familiar test, because it is a short-term test, it ignores the time dependence of the deformation resistance. Domestic standards for structural components use a critical temperature criterion for failure of steel, so effectively all steels are identical, regardless of high-temperature deformation resistance. We are studying three possible test methods for standardization. The first is the conventional high-temperature retained yield strength. The second is a slow-rate (several hours to failure) tension test, which should capture the time-dependent deformation effects. The third method is a hybrid of a creep and a conventional tension test in which the test specimen is held under constant load as the test temperature ramps upward linearly. 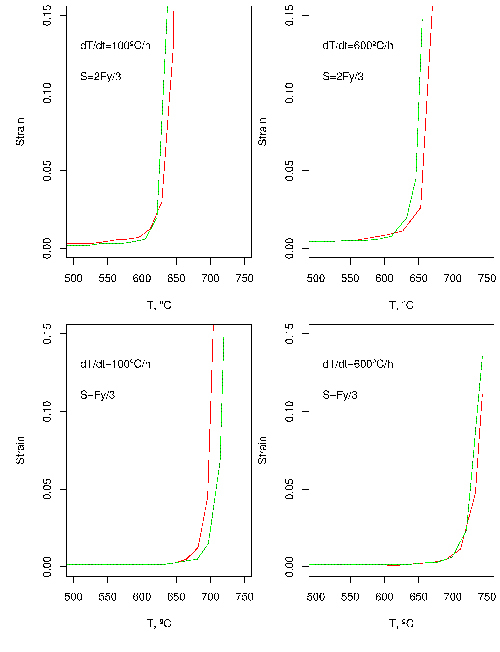 Over a narrow temperature range, which can be approximated as a critical temperature, the deformation rate increases drastically, and the specimen fails. This critical temperature can be used as a measure of the fire-resistance. One goal of this project is to build on recent worldwide research on similar tests, but to take the proof of concept to a draft standard. Each potential method has advantages, but there has been no research to compare the results of each to the others. Our research focuses on understanding the limitations, repeatability, and reproducibility of the methods by characterizing several different classes of construction steels. In the near term, after selecting a single method, we will organize an interlaboratory study (ILS) to probe the limitations and establish precision and bias. Figure 1: Comparison of tensile and ramp tests. 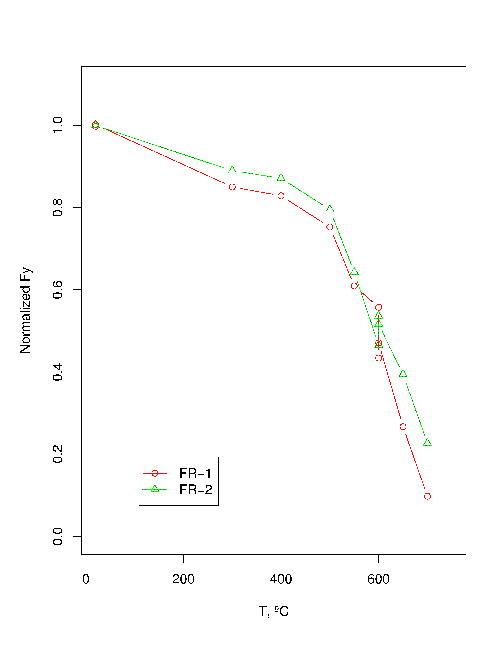 Figure 1 compares the behavior of two FR steels evaluated using high-temperature, tensile yield strength, Fy, measured in a high-temperature tensile test and the critical temperature evaluated using the temperature ramp test. Although the normalized yield strengths diverge significantly above 600 °C, the critical temperatures measured in the ramp tests are very similar. The NIST Office of Law Enforcement Standards (OLES) is currently involved in modifying existing standards for the ballistic resistance of personnel body armor and providing new performance standards for frangible bullets (designed to fully disintegrate on impact with hard surfaces). The deformation behavior of this frangible material when impacting a soft surface such as NIJ Level II or IIIA soft body armor is not as predictable as conventional bullets and requires a better understanding of the high-strain rate deformation behavior of the fabrics used in soft body armor and the various frangible materials. As part of this multi-year project, the Metallurgy Division is testing Pressed and Sintered Cu-Sn (PS Cu-Sn) bullets, one of the frangible ammunition materials selected for testing by OLES. PS Cu-Sn frangible material is made by blending a 9:1 mass ratio of Cu and Sn powder with nominal particle sizes of 50 µm, pressing the powder mixture in molds and then using transient liquid phase sintering to bind the compacts and form a Cu-Sn reaction layer (30 min at 260 °C). Sintering time and temperature are controlled to limit the reaction zone and avoid formation of the less frangible α-bronze phase. Microstructural analysis of the as-received PS Cu-Sn material has shown that the matrix consists of a mixture of copper particles with varying morphologies - some with equiaxed grain structures and others with Cu-P precipitates (possibly the result of copper powder from different suppliers). EDS analysis indicates that the binding region between the copper matrix particles consists of columnar grained Cu3Sn (ε) phase, a more blocky shaped Cu6Sn5 (η') phase, and unreacted Sn. SEM fractographs of Kolsky Bar specimens have shown brittle fracture in the ε phase, brittle cleavage in the η' phase, and ductile failure with micro-void coalescence in the copper matrix adjacent to the intermetallic layers. The mechanical deformation of PS Cu-Sn frangible bullets has been examined at conventional strain rates and at high strain rates in compression in the NIST Kolsky Bar facility. Kolsky bar tests have been performed to assess the compressive stress-strain behavior at strain rates up to 103 s-1. Dynamic tensile strength has also been measured using the Kolsky Bar to perform diametral compression tests, or Brazil tests. In this test, a disk of the bullet material is exposed to a rapidly rising stress pulse along its diameter, which creates a tensile stress perpendicular to the applied load. A crack eventually forms due to this tensile stress, from which the tensile strength can be measured. Typical Brazil tests involve purely brittle materials, and only the elastic deformation behavior of the sample is needed to determine tensile strength. However, in the case of frangible bullet materials, significant plastic deformation was observed before failure. Finite element modeling (Figure 1) was used to determine how plastic yielding affected the evolution of tensile stress in the sample during the test in order to obtain a more accurate estimate of the tensile strength. The high-strain rate plastic flow and tensile strength data can then be used to model the deformation and breakup of a frangible bullet as it impacts a soft armor-like surface. 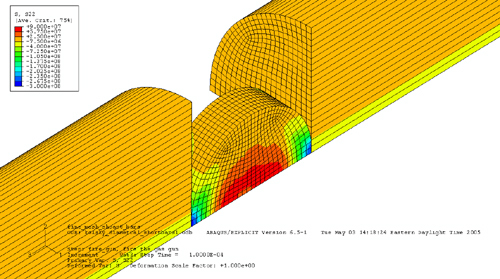 Figure 1:3-D simulation of diametral test of frangible ammunition cross-section. These data and associated bullet impact modeling efforts will be used by the NIST Office of Law Enforcement Standards in a continuing effort to develop a performance standard for frangible ammunition and in the revision of the National Institute of Justice Ballistic Resistance of Personnel Body Armor Standard. A critical element of the nation's infrastructure is the more than 3 million km of natural gas and hazardous liquid pipelines that deliver almost 2/3 of the nation's energy. Following the passage of the Pipeline Safety Improvement Act in 2002, NIST began working with the pipeline industry, DoE, DoI's Minerals and Management Service, and DoT's Office of Pipeline Safety to provide the measurement methods, standards, and data needed to understand corrosion, fracture, and fatigue failure mechanisms in this critical element of the nation's infrastructure. After Congress passed the Pipeline Safety Improvement Act in 2002, NIST, DoE, and DoT developed a memorandum of understanding (MOU) detailing a coordinated program of research, development, demonstration, and standardization. The goals of the program are to continue improvements in the safety and operation of pipelines and related facilities. NIST has a long history of contributions to pipeline safety and, in this project, is responsible for materials research addressing concerns with corrosion, fatigue, and fracture, especially as pipelines are pushed to higher performance using new materials and higher pressures. Figure 1: Corrosion analysis (historical data), power law exponents. At the urging of the Pipeline Research Council International (PRCI) and DoT's Office of Pipeline Safety (OPS), NIST reexamined data from the original NBS underground corrosion studies conducted between 1920 and 1957, involving over 36,000 samples buried at 128 different sites across North America. The original study was found to be thorough and ahead of its time with respect to statistical analysis. 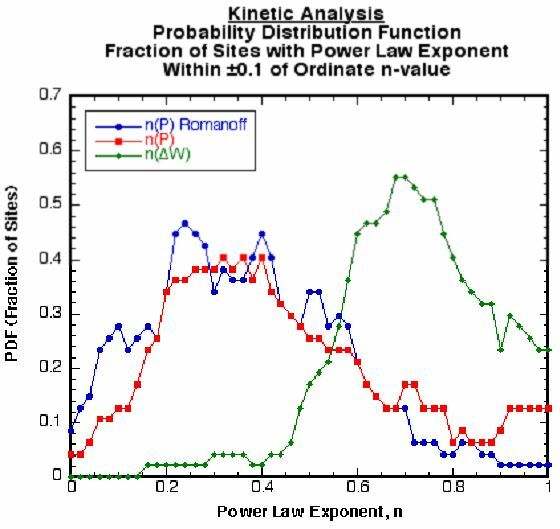 Figure 1 compares the results of the power law exponent fit determined in the original study to that determined by modern computer curve fitting routines. This figure shows: (i) strong evidence of non-linear kinetics and decreasing corrosion rates, and (ii) that only minor differences were obtained with modern analysis. In both original and new analyses, the scatter in the data limits the conclusions. The origin of this scatter needs to be understood before less conservative non-linear kinetics can be used for rate models. Figure 2: Crack tip opening angle behavior - conventional steel. Fracture and fatigue studies are underway on both traditional and modern steels. By acquiring and publishing data on these properties, NIST hopes to enable better modeling of performance. 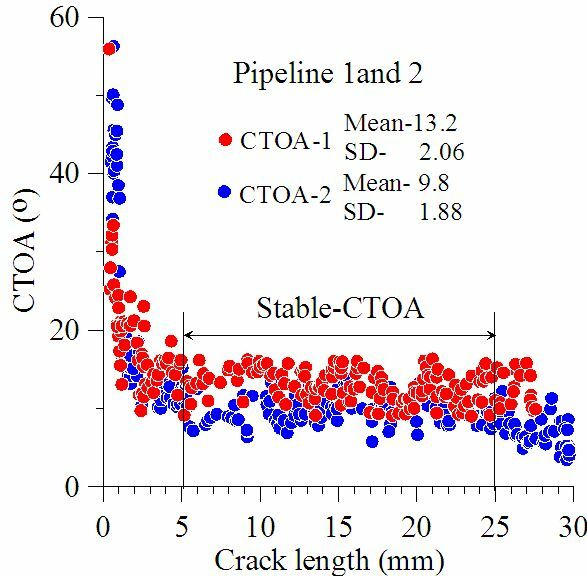 The focus of this study is to assess the ability of different pipeline steels to arrest crack propagation. Crack tip opening angle (CTOA) measurements were made on samples cut from the pipeline samples. Figure 2 shows the CTOA measurements on two baseline steels and the region of stable crack growth. Working with OPS, MMS (DoI), DoE, PRCI, American Gas Association, the Gas Technology Institute, ASTM Intl. NACE Intl. CANMET, and the National Energy Board (Canada), NIST organized a workshop on Advanced Coatings for Pipelines and Related Facilities held at NIST June 9-10. Sixty representatives of the pipeline industry, suppliers, and government agencies from the U.S., Canada, and the UK attended this meeting. 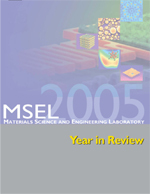 NIST also assisted OPS in organizing the Government/Industry Pipeline R&D Forum in Houston, Texas, March 22-24, 2005.